Courtesy of Paul Duginski, political cartoonist and veteran newspaper artist in Southern California. What better way to spook Californians this Halloween than to appear as a slobbering “Godzilla El Niño.” Or draped in a bedsheet as Godzilla’s opponent, “The Blob,” the amoeba-shaped patch of unusually warm Pacific water blocking storms in California. This entry was posted in Halloween, Wild and Wacky and tagged Denise De Carion, drought, El Niño, Halloween, Jay Lund, Kyle Phillips, Louie. Bookmark the permalink. Maybe the blob is antithetical to the nino, but the blob is moving very methodically in a circuit generally consistent with the Hadley circulation. What if during PDO negative (in the 60 year sense) episodes, ninos became more of a NORTHERN oscillation? I should crop this thing because really the top graphic is more interesting in this regard. See the blob? 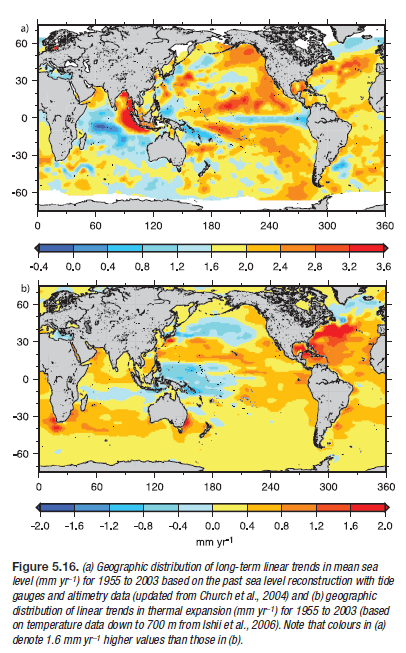 Well at least a few months back, but this is not SST’s from 2015, this is mean sea level trends 1955 to 2003. Methinks the blob is nothing new.